Box Text: There's only one way to get your hands on a PB-1 flamethrower... you gotta earn it. As Earth Command Lieutenant Aileen Harding, battle hordes of ferocious aliens and huge bosses to save SATS and its helpless human inhabitants from certain doom. 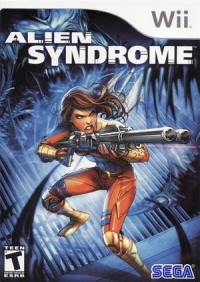 • Annihilate more than 100 vicious alien species using the unique Wii shooter controls and finishing moves in high-speed combat. • Discover hundreds of weapons, armor types, and special abilities in this Shooter-RPG. • Play exciting Wii-specific mini-games, and tackle four-person co-op multiplayer. 02-11-2019 silverbow Box Text There's only one way to get your hands on a PB-1 flamethrower... you gotta earn it. As Earth Command Lieutenant Aileen Harding, battle hordes of ferocious aliens and huge bosses to save SATS and its helpless human inhabitants from certain doom. 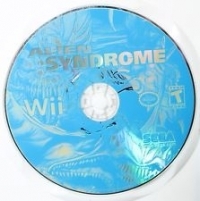 • Annihilate more than 100 vicious alien species using the unique Wii shooter controls and finishing moves in high-speed combat. • Discover hundreds of weapons, armor types, and special abilities in this Shooter-RPG. • Play exciting Wii-specific mini-games, and tackle four-person co-op multiplayer. 04-27-2014 jamusaeons Box Text There's only one way to get your hands on a PB-1 flamethrower...You gotta earn it. 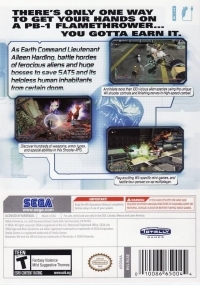 As Earth Command Lieutenant Aileen Harding, battle hordes of ferocious aliens and huge bosses to save SATS and its helpless human inhabitants from certain doom.